Hair is often referred to as our 'crowning glory' but styling, colour treatments and diet can all affect the appearance of our hair. 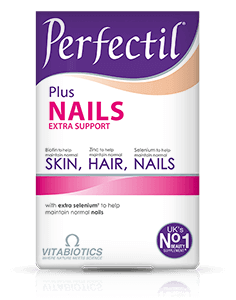 Perfectil Plus Hair has been developed for those with a particular interest in maintaining the health of their hair, as well as great all round support for skin and nails. Hair serves a valuable biological purpose in keeping your head warm and helps regulate body temperature. Of course it does much more than these basic functions and in many ways helps to communicate important messages about who we are and how we feel. Hair has two distinct structures - first, the follicle itself, which resides in the skin, and second, the shaft, which is what is visible above the scalp. Typically each hair stays with you for three to five years until it falls or grows out, then a new strand starts to grow. The rate or speed of hair growth is about 1.25 centimetres or 0.5 inches per month, or about 15 centimetres or 6 inches per year. For both women and men, hair is an important part of our identity. We often invest significant time and money in grooming, styling and colouring it to express our personality, and as such it needs, and deserves, the best possible care to ensure we show it at its best. 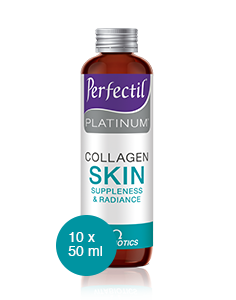 Perfectil Plus Hair provides your skin, hair and nails with a comprehensive spectrum of the essential bio-active nutrients. As well as benefiting these areas, Perfectil Plus Hair also safeguards your diet by doubling up as a comprehensive multivitamin for all round health. There is no need to take an additional multivitamin. Perfectil Plus Hair is available in the UK from Boots, supermarkets, pharmacies and health stores. Alternatively order online here. Calcium Carbonate & Microcrystalline Cellulose, Inositol, Horsetail Extract (Equisetum Extract, Silicon Dioxide, Maltodextrin), Marine Collagen (from Fish), Magnesium Hydroxide (Carrier: Maltodextrin), Anti-Caking Agents: Silicon Dioxide, Stearic Acid & Magnesium Stearate, L-Cystine, Vitamin C (Ascorbic Acid [Carrier: Hydroxypropylmethylcellulose]), Tablet Coating (Hydroxypropylcellulose, Purified Talc, Hydroxypropylmethylcellulose, Natural Source Colours [Titanium Dioxide, Iron Oxides]), Pantothenic Acid (as Calcium Salt), Vitamin E (D-Alpha Tocopheryl Acid Succinate) (from Soya), L-Methionine, Folic Acid (as Pteroylmonoglutamic Acid [Carrier: Dicalcium Phosphate Dihydrate]), Crosslinked Cellulose Gum, Ferrous Fumarate, Citrus Bioflavonoids, Potassium Iodide (Carriers: Dicalcium Phosphate Anhydrous & Hydroxypropylcellulose), Niacin (as Nicotinamide), Zinc Oxide, Biotin (Carrier: Dicalcium Phosphate Dihydrate), Thiamin (Vitamin B1 as Mononitrate), Vitamin B6 (as Pyridoxine HCl), Betacarotene (Starch, Water, Antioxidant: DL-Alpha Tocopherol), Vitamin D3 (Cholecalciferol [Carriers: Acacia, Sucrose, Corn Starch, Medium Chain Triglycerides, Antioxidant: DL-Alpha Tocopherol]), Grape Seed Extract, Co-Enzyme Q10, Manganese Sulphate, Riboflavin, Sodium Selenite Triturate (Carrier: Microcrystalline Cellulose), Vitamin B12 (Cyanocobalamin [Carrier: Trisodium Citrate, Citric Acid, Maltodextrin]), Copper Sulphate, Chromium Chloride. Allergy Advice: For allergens, see ingredients in bold. TWO TABLETS PER DAY WITH YOUR MAIN MEAL. Swallow with water or a cold drink. Not to be chewed. Do not exceed the recommended intake. Perfectil Plus Hair should only be taken on a full stomach. Perfectil Plus Hair is a comprehensive formula so may be used in place of a daily multivitamin. This comprehensive formula replaces other Perfectil supplements and multivitamins. There is no need to take an additional multivitamin. As with other food supplements, consult your doctor or pharmacist before using if you are under medical supervision, pregnant, breast-feeding, have epilsepsy, a thyroid condition, haemochromatosis suffer from food allergies allergies or are allergic to any of the ingredients. Made in a site that may handle nuts. Not suitable for children. Allergy Advice: For allergens, see ingredients in bold. Food supplements must not replace a varied and balanced diet and a healthy lifestyle. This product contains iron, which if taken in excess, may be harmful to very young children. Store below 25°C in a dry place, out of sight and reach of children. Who should use Perfectil Plus Hair? Can Perfectil Plus Hair be used during pregnancy and breast-feeding? Can Perfectil Plus Hair be taken simultaneously with medicines? 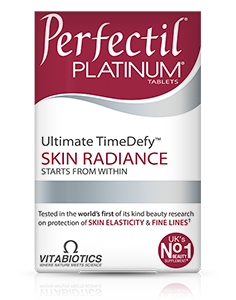 Should I take a multivitamin together with Perfectil Plus Hair? 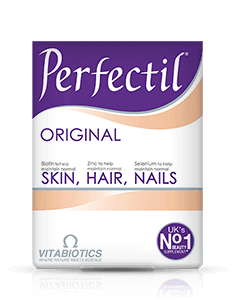 How many tablets does one pack of Perfectil Plus Hair contain? How and when should Perfectil Plus Hair be used? 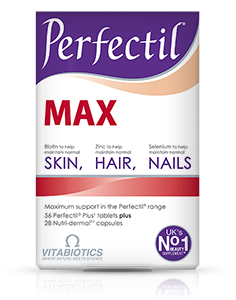 What happens if I forget to take my Perfectil Plus Hair tablets and miss a day? 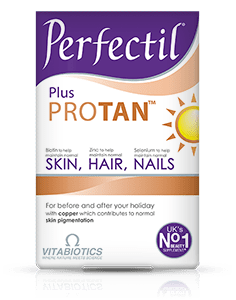 Are there any undesired effects whilst taking Perfectil Plus Hair? Perfectil Plus Hair formula has been developed for those who want to maintain the health of their skin and nails, but have a particular interest in maintaining their hair health and wish to give this aspect extra support. Key nutrients include biotin, selenium and zinc which contribute to the maintenance of normal hair. Plus the unique Colourel Blend, with copper which contributes to normal hair pigmentation. The specialist formula also includes amino acids, marine collagen, inositol and grapeseed extract.